This research study involves the extensive use of secondary sources, directories, and databases (such as Hoovers, Bloomberg BusinessWeek, and Factiva) to identify and collect information useful for this technical, market-oriented, and commercial study of the bioresorbable polymers market. The primary sources mainly include several industry experts from core and related industries and preferred suppliers, manufacturers, distributors, service providers, and organizations related to all segments of the industry’s supply chain. After arriving at the overall market size, the total market has been split into several segments and subsegments. The figure below illustrates the breakdown of the primary interviews based on company type, designation, and region conducted during the research study. The value chain of bioresorbable polymers starts with the procurement of raw materials required for its manufacturing. The main raw materials used for the production are proteins, polysaccharides, lactide, glycolide, and caprolactone. These different sources of raw materials are mainly used to obtain a polymer that serves different applications efficiently. These raw materials are supplied to the bioresorbable manufacturers such as Corbion N.V. (Netherlands), Evonik Industries AG (Germany), Foster Corporation (U.S.), KLS Martin (Germany), and Poly-Med Inc. (U.S.). Major value is added to the bioresorbable polymers during the manufacturing process. A great amount of effort and expertise, mainly in terms of balancing the ingredients, is required to manufacture a polymer suitable for different applications. The major applications where these manufacturers supply bioresorbable polymers include orthopedics, drug delivery, and others. This report categorizes the global bioresorbable polymers market based on type, application, and region. The global market size of bioresorbable polymers was USD 661.9 Million in 2015 and is projected to reach USD 1,407.5 Million by 2021, at a CAGR of 13.42% between 2016 and 2021. The cost-effectiveness, patient-friendliness, and the growing demand in the drug delivery application are expected to drive the demand of bioresorbable polymers, globally. The orthopedics application dominated the bioresorbable polymers market during the forecast period, closely followed by drug delivery in 2015. Drug delivery application is also expected to witness the highest growth rate between 2016 and 2021 due to growing number of implant surgeries in North America, Europe, and Asia-Pacific. The growing healthcare industry in the U.S., the Middle East, and Asia-Pacific countries such as China, Japan, and India is also driving the market. The market is classified based on type: agro-polymers and biopolyesters. The market is dominated by biopolyesters due to their enhanced quality and high resistance to poor environmental conditions. The biopolyesters segment is also projected to be the fastest-growing type of bioresorbable polymers during the forecast period. Currently, North America is the largest bioresorbable polymers market, in terms of value, closely followed by Western Europe. Some of the factors driving the growth of the North American market are high growth of end-use industries, amplified local manufacturing, and increased number of domestic players in various vertical market segments. Asia-Pacific is expected to be the fastest-growing market due to high demand from orthopedics and drug delivery applications. 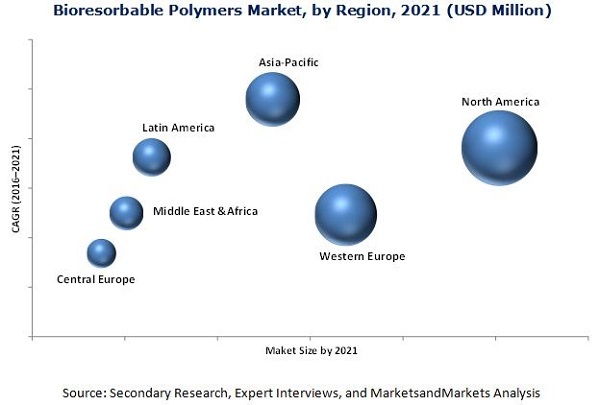 The presence of major developing nations such as China, India, and South Korea is also a major driver of the bioresorbable polymers market in the region. The major restraints of the market are high price of bioresorbable polymers and lack of quality control measures in developing countries. Expansion is the most preferred strategy adopted by the key market players to sustain in this highly competitive market. The major opportunity for bioresorbable polymers manufacturers are the upcoming technologies such as electrospinning and 3D printing. Some of the important manufacturers are Corbion N.V. (Netherlands), Evonik Industries AG (Germany), Foster Corporation (U.S.), KLS Martin (Germany), and Poly-Med Inc. (U.S.). Companies in this market compete with each other with respect to prices and product offerings to meet the market requirements. Figure 38 Drug Delivery Application Will Witness High Growth in Bioresorbable Polymers Market in U.S. Figure 55 Orthopedics is the Largest Application of Bioresorbable Polymers in U.K.